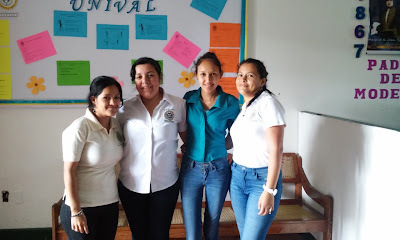 Last week we enlarged our list of clients in Matagalpa by a new group of four ladies. They call themselves “Omega” and their story describes well a hard reality of living in Nicaragua. Andrea, Ethel, Belkis and Dori all work at a local university, Unival, and have been sharing the same office for almost five years. Unfortunately even though they all have a steady job, their salaries are so low, that they have to look for other source of income outside the university in their free time. Andrea, Ethel, Belkis and Dori from "Omega"
Apart from working as administrative assistants Andrea, Belkis and Dori sell cosmetics to their relatives, friends and neighbors and Ethel opened a beauty salon business in her house where she works in the afternoons and Sundays as a hair stylist, make-up artist and manicurist at once.